Snakes have a bad reputation. It’s a shame, really, ’cause plenty of them are pretty nice. The Monster Serpent, however, is not nice. 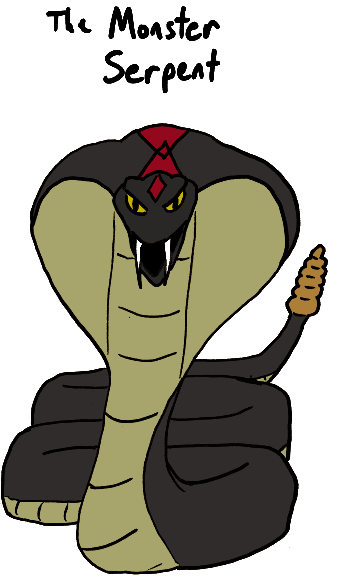 This monstrous snake is as cruel and cunning as any stories snake has ever been. The countryside around her lair is unusually empty, for even the animals have come to fear the dire snake that feasts on any who come within its range. When hungry, the serpent will leave her grounds to hunt for any animals, including wolves, bears, and even humans. The only being brave enough to defend the nearby animal population from this beast is another beast, the Horribloid. The Horribloid is one of the ideas I had during the superhero year that I came to like more than I ever expected. 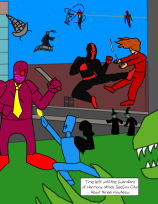 I built up this whole superhero/Lord of the Rings/Watership Down sort of setting and it took off in my mind. I wanted to come up with a villain for that setting that is not a human and this was the result. 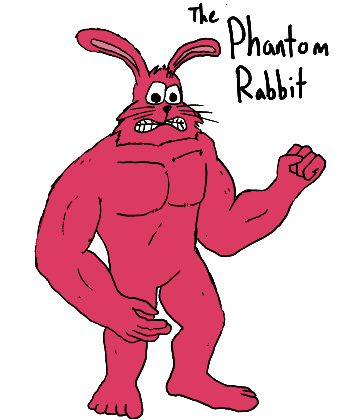 When Chuck Grosnington was bombarded by radioactive space energy, he mutated into a hulking pink rabbit man strong enough to shatter steel and leap miles at a time. Calling himself the “Phantom Rabbit” he has decided he can do whatever he wants now, so he rampages around and acts like a total jerk. I can still remember the day when I was in my late teens, working at my summer job and, quite bored, I drew the Phantom Rabbit. I just liked the idea that, in spite of their being nothing remotely “phantomy” about the character, he insisted on being called “The Phantom Rabbit”. Anyway, when I realized that I managed to do two rabbit-related heroes last year, I knew I had to get at least one rabbit villain, so the memory of this character came back. “Monster Serpent” and “Phantom Rabbit” seemed like a good pair to put up in one post.